Nestlé Cereals is launching its new Breakfast to Go range, the first packaged cereal and milk solution, to help busy Brits enjoy tasty breakfast cereal on-the-go. More than one in ten (15%) adults in the UK eat breakfast at work or on-the-go, rising to almost a quarter (24%) of those aged 25-34 and one fifth (21%) of those aged 35-44, according to research by Nestlé Cereals. The handy packs come in a choice of two popular cereals: Shreddies or Shredded Wheat Honey & Nut. 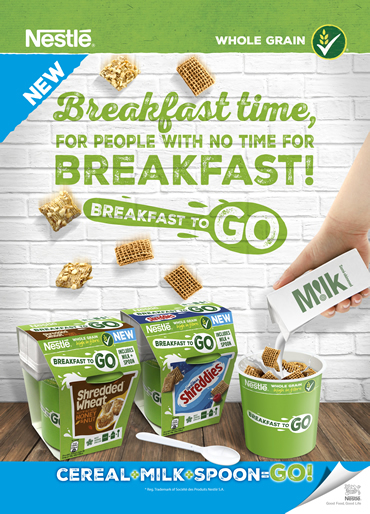 Containing a pot of cereal, milk and a spoon, Breakfast to Go is designed to be a simple and convenient way for consumers to enjoy some of their favourite cereals at work and on-the-go. 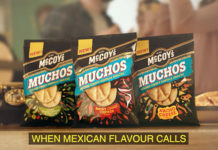 The new products are designed to meet the rising trend towards out-of-home breakfasts in the UK. Brits spent £5 billion on out-of-home breakfasts in 2017, with the average person eating breakfast on-the-go at least once a week spending about £2.30 each time, according to research by Kantar Worldpanel. While cereal is one of the most popular choices for in-home breakfasts (eaten at 1 in 2 occasions), due to limited choices it is only eaten in 1 in 20 occasions out-of-home. 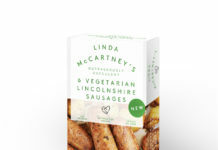 Consumers will see the new packs hit the shelves at Co-Op Food and Nisa from this month with an RRP of £1.99. Nestlé Cereals is making breakfast better by providing tasty and convenient breakfast cereals for individuals and families. By 2020, every cereal that carries the green banner will have whole grain as the number one ingredient. Kantar Worldpanel Breakfast Out of Home ‘How we buy and consume on the go’ study, March 2018. Cereal Partners UK (CP UK) is the UK operation of Cereal Partners Worldwide. Cereal Partners Worldwide (CPW) is a leading global breakfast cereal company and the maker of Nestlé Breakfast Cereals, including favourites such as NESQUIK®, SHREDDED WHEAT®, CHEERIOS® and SHREDDIES®. With more than 50 brands to suit all ages and lifestyles, CPW strives to make convenient and tasty cereals that helps people start their day.